The Ford Edge was first launched in the latter half of 2006. From day one it distinguished itself from the common truck based SUV’s by delivering a car based alternative to the market. The driving characteristics proved to be more appealing to a larger portion of the consumer base, as it provided a more car like feel. For 2015, Ford has upped the Edge’s game with a new look and two all new engine options. The Edge is built on Ford’s global mid-size platform, and will be sold over 100 markets earth wide. The 2015 Edge will begin selling early this year, and offers new technologies and increased utility. The Edge now uses the award winning platform of the 2012 Fusion. It incorporates an all new independent rear suspension with the previous year’s MacPherson strut suspension upfront. The suspension is aided by the new and stiffer solid body structure. The end result should be a better handling vehicle with a noticeably quieter and smoother ride. The 2015 Edge is a touch longer and bit taller than its predecessor and the wheelbase has been lengthened by 1.0 inch, to 112.2 inches. As for the appearance, it has a more modern and athletic form. Although it is actually larger, to my eyes the Edge looks smaller, with the deep door panels drawing the roof line down. The new front fascia is an improvement in my opinion, with the larger grille and hood creases adding a more aggressive face. The dashboard and center console have been designed to look like one piece. On some models a center console mounted 8 inch touchscreen featuring the MYFord Touch and Sync is available. Adding to the increased utility are several storage areas throughout the vehicle. As an example; there is a covered media bin on top of the center stack and an open storage area below the climate controls. 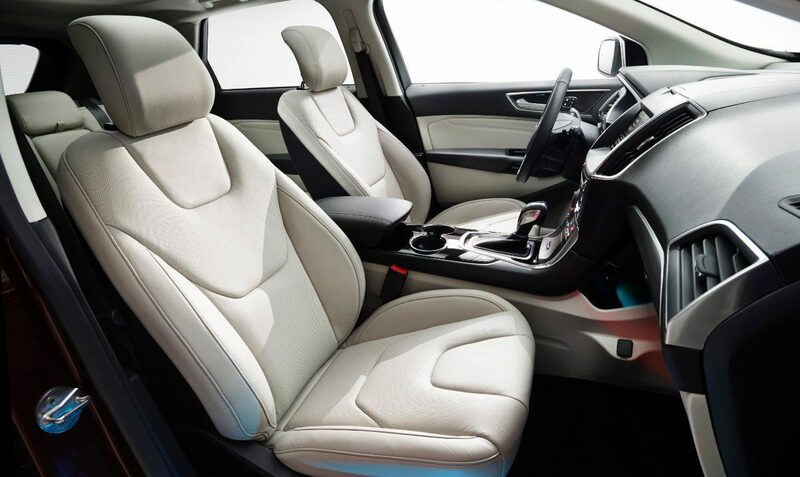 The new seats are thinner but manage to be more supportive. The thinner cushioning and increased leg room – 1.9 inches in front and 1.0 inch in back – add to a more open feel. For the tall among us, headroom has increased throughout the cabin by 1.0 inch. The overall cargo space has increased as well. Now, with 39.2 cu.ft. of cargo capacity behind the second row, it offers 7.0 cu.ft. more than the outgoing model. Total capacity with the rear seats folded is 73.4 cu.ft. 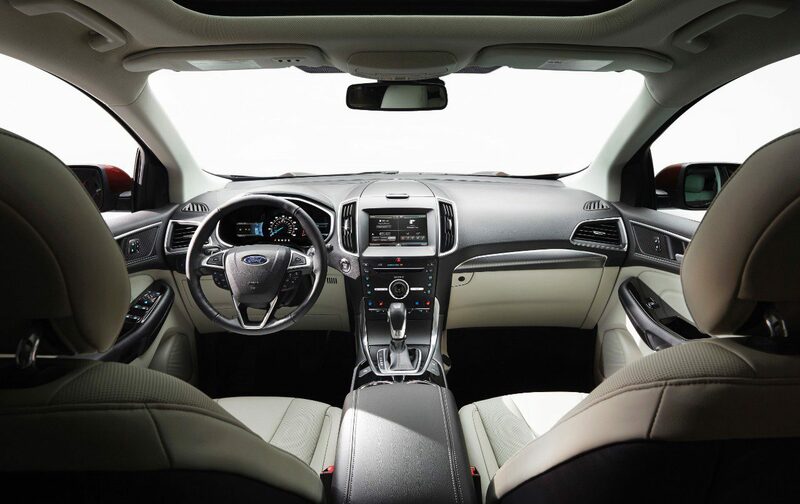 The 2015 Edge features two all new Ecoboost engines. The standard engine is the new 2.0L 4 cylinder Ecoboost that produces 245 hp and 270 lb-ft of torque. This engine, with the optional towing package, is capable of towing up to 3500lbs. The Edge Sport will come equipped with the new 2.7L Ecoboost V6. This engine is expected to produce over 300 hp, and make this the sportiest Edge yet. The 3.5L naturally aspirated V6 from the previous version will also be available. All three engines come paired with a 6-speed automatic transmission that has shift paddles. All three can be had with AWD. Though pricing is not yet available, I was able to find some information on the costs associated with ownership. These prices reflect one dealerships estimates based on present costs for the 2014 Edge. They do not expect much of a change. Front and Rear Brake Replacement $1000.00 + tax approx. Cost includes labor pads and rotors.